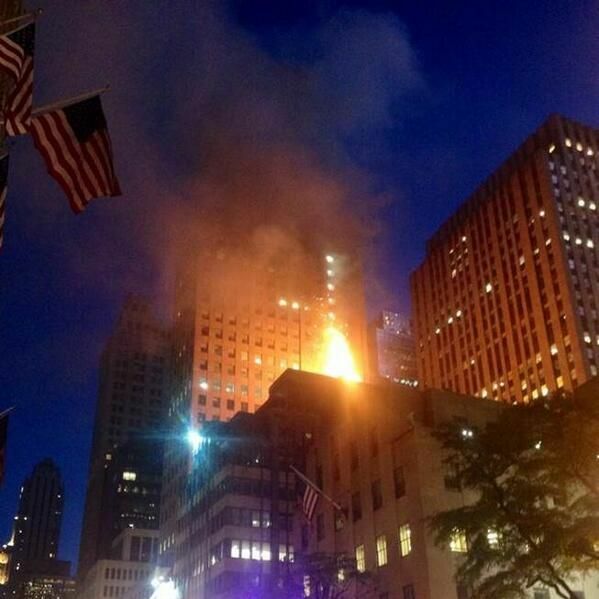 A three-alarm fire broke out at the giant TGI Fridays near Rockefeller Center on Friday night, shutting down Fifth Avenue in between 46th and 50th Streets for several hours. The New York Daily News reports that more than 125 firefighters were called to put out the blaze, which shot flames into the air and filled much of the area with smoke. Though there were around 100 people in the building at the time, everyone was able to evacuate and no one was seriously injured (one firefighter did suffer minor smoke inhalation). “It started over the grill,” said a TGI Fridays employee. “It shot right up the wall. It was flame and smoke everywhere.” Another worker told the paper, “It was hell.” Meanwhile, some midtown tourists thought that the frightening scene was actually pretty neat. Robert Herring of North Carolina, said, “I’ve never seen anything like this before. “I especially enjoyed getting chewed out by the cops for crossing their police tape,’’ he said. According to NBC New York, the fire appeared to have been caused by a “malfunction while crews were working on a duct in the basement, and a fire was sparked, quickly shooting through the duct up to the roof, where it spread to a connecting duct in the building next door.” Only in the Big Apple!